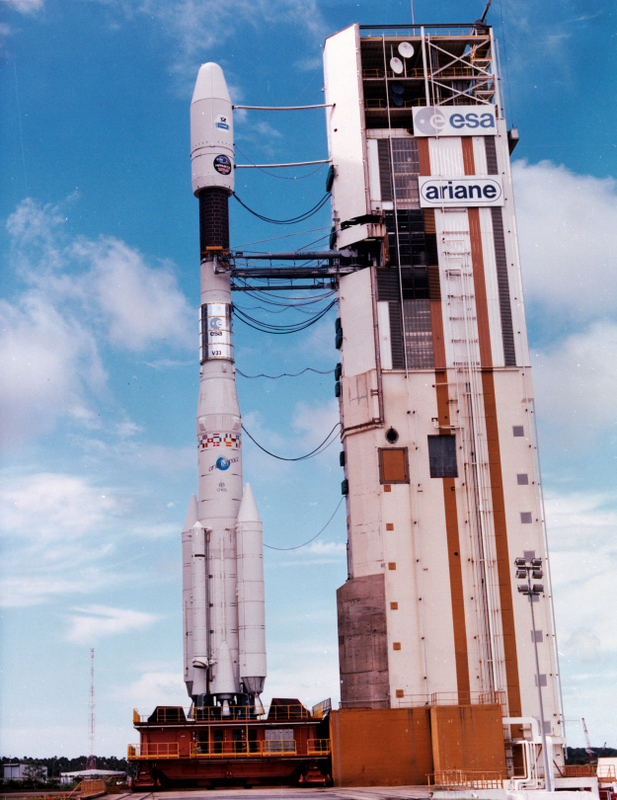 Ariane-4 V33 on launch pad with Hipparcos and TV-Sat 2 on 8 August 1989. Launched in August 1989, Hipparcos was a pioneering space mission dedicated to the precise measurement of the positions, parallaxes and proper motions of the stars. The intended goal was to measure the five astrometric parameters (position in right ascension and declination, proper motion in right ascension and declination, and parallax) of more than 100 000 primary programme stars to a precision of some 2 to 4 milliarcsec, over a planned mission lifetime of 2.5 years, and the astrometric and two-colour photometric properties of some 400 000 additional stars (the Tycho experiment) to a somewhat lower astrometric precision. Having achieved the mission goals, communications with Hipparcos were terminated in August 1993. The Ariane-4 V33 launch of 8 August 1989 carried ESA's Hipparcos astrometry mission and Germany's TV-Sat-2 direct broadcast satellite.